Cast as a prince who falls for a spinster in Matteo Garrone’s fairy-tale anthology Tale Of Tales, the French actor Vincent Cassel proved that he could do a mean impression of a horny cartoon wolf, which is enough to make him seem like an inspired and maybe even subversive choice for the role of the hairy monster in an adaptation of “Beauty And The Beast.” Alas, Christophe Gans’ storybook version—which was released internationally in 2014, but is only now making its way to U.S. theaters—makes Cassel into a brooding creature in a velvet doublet, modeled on the Beast in Jean Cocteau’s classic 1946 interpretation of the fairy tale. This is the only real inspiration Gans (who also-co-wrote) takes from Cocteau; his attractive but tiresome effects-laden adaptation of this old and familiar story is not one for poetry or metaphor. Gans’ Beauty And The Beast, however, belongs to the most rote category of interpretations, hinting at nothing darker than a fascination with sulking bad boys bored by wealth. The popular Disney animated version at least gave the Beast a hyper-macho competitor in the form of Gaston, a more sinister romanticized danger. 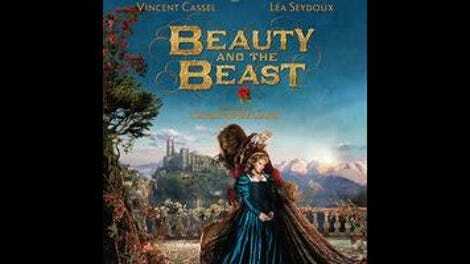 The Beast is the real fantasy every version of this story offers, and this one is a superficial CGI creation. His ability to pounce over great distances doesn’t make him seem like an animal, but like a weightless effect. And effects of one kind or another are just about all that Gans wants to offer: digitally added glows, scampering beagle-like gremlins, CGI townscapes and shipwrecks. In film, the best effects aren’t necessarily the ones used sparingly, but the ones used suggestively; a close-up might suggest a whole monster, while a panoramic view might invite the viewer to imagine the universe that would produce it. But Gans’ Beauty And The Beast has nothing to suggest. The French filmmaker had his breakthrough with 2001’s Brotherhood Of The Wolf, a swashbuckling 18th-century martial arts horror flick that put everything it could think of (monsters, secret history mumbo-jumbo, an Iroquois sidekick, a dissolve in which Monica Bellucci’s bare breasts become two mountaintops, etc.) on screen. Beauty And The Beast is only his second film since then (the other was the video game adaptation Silent Hill), and it has the same “show, show, show” mentality, sometimes undercut by the modest effects budget of a European co-production. There are alluringly lit dresses, shots framed through ice and magical pools of water, and digital backdrops of incredible scale: frozen lakes the size of small seas, overgrown castle courtyards that could fit whole towns, foreboding mountains. But without a poignant note or undercurrent of suggestion, it amounts to a world of effects, rather than a world of magic. The film maintains the thinnest possible conception of both Belle and the Beast (she’s virginal and selfless, he’s saturnine), while bloating the plot in an effort to give itself more of an action-packed third act. (The overlong climax involves a gang of thieves to whom Belle’s brother owes money and a battle against some stone giants.) Working with a beloved fairy tale and an 18th-century setting for which he clearly has more than a little fondness, Gans clearly has a lot that he wants to show, often indulgently. But what he or anyone involved might have seen in the material remains a mystery.